The title says it all – Ryan Dungey came to Minnesota as a local hero and left as the winner on the night. 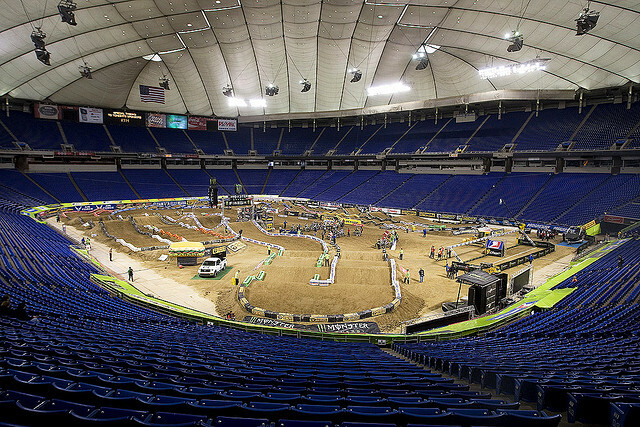 Dungey has ridden consistently throughout the series and it all paid off that night under the roof of the Hubert H. Humphrey Metrodome in Minneapolis. Following the same maneuver last week, Mike Alessi snatched the holeshot in the 450 Main Event. The track was quick and, fortunately, relatively incident-free; no such luck however for James Stewart, who was forced to bow out mid-race. After a blistering 49 second lap, Dungey made the move on Villopoto to take him just before the end to win the Main Event ahead of Villopoto (Monster Energy Kawasaki, 2nd) and Davi Millsaps (Monster Energy Racing Suzuki, 3rd). “Growing up as a kid here in Minneapolis and coming here to watch the Supercross and now I find myself in the position of being on the gate – it’s a dream come true,” Dungey said afterwards. “It’s been a while so it’s good to get here on top of the box,” he said. Back in the 250SX class, consistency kid Marvin Musquin carried on his shining form to win the final race. By lap three the Red Bull KTM rider was out in front before extending his lead to six seconds. In his fourth win this season, he held off Wil Hahn (GEICO Powersports Honda, 2nd) and Blake Wharton (Rock Star Energy Racing Suzuki, 3rd). “It was a perfect day and a great feeling – I just try to win and don’t worry about what happens,” Musquin said. Ryan Villopoto still leads the 450 points table on a grand total of 299, followed by Ryan Dungey (277) and West Coast master blaster Davi Millsaps just one behind on 276. Wil Hahn’s leading the 250 class with 178 points in above Marvin Musquin (173) and Blake Wharton (153). Don’t go away – the series ventures westward to Seattle for the weekend.